I was honored to be asked to judge the third year of this contest from the Museum of Contemporary Art San Diego. There were several excellent pieces and the skill level was impressive. Public voting is open until noon, June 4. They need a better name for the contest, though. Maybe “MCASD: First Quarter”? 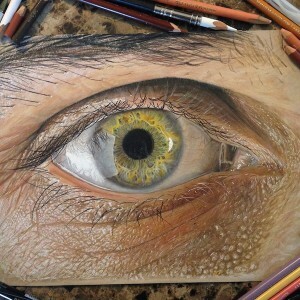 A sample: Look Closely, colored pencil by Jose Antonio Lopez Vergara, age 19. Adding these to my go-see list. Glashaus looks like it’s roaring back to life under the steady management of Rondi Vasquez. The beautiful Barrio Logan warehouse, with its curved timber roof and glass factory past, seemed to go dormant for awhile after co-founder Greg Brotherton moved back to LA. Now there’s a waiting list for studios and the airy central space is again being used for exhibits. Kathleen Mitchell and Rich Stewart’s names were new to me, so I stopped by for a quick look before the show opened. According to their website, both were instructors at UCSD Crafts Center. Kathleen taught glassblowing and lampworking, and Rich taught metal casting. The duo’s work fit beautifully into the Glashaus setting. It’s reminiscent of Brotherton’s sculptures, with similar touches of steampunk. Coppery surfaces, barbed wire, wood accents, and weathered found objects — but lightened by Kathleen’s blown glass. It’s a tricky vein to mine. One rooster too far and a piece could slip into whimsical twee. Then there’s the nostalgia of found objects, and whether to respect or reinvent their purpose. Something once valued was lost or thrown away, and each piece carries that weight. Is that why there are so many cages in this show? The items nestled inside – are they resting comfortably in their new homes? Are they now precious, reclaiming the status of being on display? Or are they trapped? There’s no question about Kathleen’s Golden Child. Eerie blue eyes look up, his hands caught in straitjacket of rough fabric, a cloud of shattered light bulbs around his feet. This child is ensnared by external expectations, unable to move. 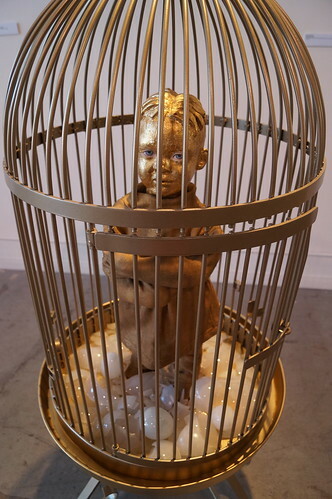 The title, Inchoate, didn’t seem to fit the show – unless, perhaps, Kathleen and Rich intend to dive deeper into the darker territory of Golden Child and this was their first attempt. Kathleen may be up for it; she likes the dangerous aspect of glassblowing. Let’s hope they continue to explore more risky, fertile, psychological concepts like this one.